Get Unlimited Dating Traffic Now! Did you know that advertising on Google AdWords can cost you over $4 dollars per click? That's outrageous! Get the dating traffic you need right now at a fraction of the cost! AdvanDate is pleased to offer unlimited dating traffic to your dating site. With over 100,000 impressions per day, your dating site will get the dating traffic that it needs. Right now the AdvanDate Dating Ad Network serves over 100,000 impressions per day and over 50,000 clicks per month. This is high quality dating traffic and it's guaranteed. This means we guarantee that the traffic you receive will be 100% real, high quality dating traffic. The best type of dating sites that will benefit from this unlimited dating traffic are free dating sites or new dating sites that are just starting out and need that traffic to help build their profile bases. When an ad campaign can’t be targeted in our dating network, a house campaign ad is shown. Adding your 728x90 banner to our house traffic will increase dating traffic to your dating site and increase your profile base. This is global traffic. If you want more dating traffic, consider the Premium or Platinum traffic packages. Cancel at anytime. This is our premium traffic and consists of targeting traffic in the US, Canada and UK. Your ad campaign will get top placement in the ad network and give you more impressions and more clicks to your dating site. If you would like global top placement in the ad network then consider the Platinum traffic package. Cancel at anytime. This is our platinum traffic package and it consists of 2 top ad placements in all major countries around the world including US, Canada, UK, Australia, China, Japan and more. Your 728x90 banner ad campaigns will get you more impressions and more clicks to your dating site. This is great for global dating sites. Cancel at anytime. If you’re ready to start sending unlimited quality dating traffic to your dating site, simply click on the package above that you would like. Once you purchase the dating traffic, simply send us a 728×90 banner ad along with your site URL and we'll get your ad campaign added to the dating ad network. "We were paying $3 dollars a click with Google and the daily budgets were eating up our profits. The Advandate traffic solved that issue immediately. 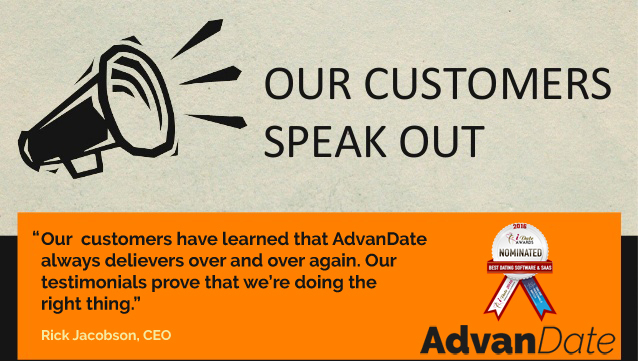 You need dating traffic and Advandate delivers." "Great traffic. Amazing price. Simply can't beat it." "If you need dating traffic then you simply need to try the advandate dating ad network. You'll be surprised. We were!"